← 12 days until The Giant’s Shoulders #13! For a part of this past week I was at a workshop in California, and a lot of excellent theoretical and experimental researchers of metamaterials were present. One of the points stressed by many of them is the difference between the idea of ‘negative refraction’ and a ‘negative refractive index’. I had been vaguely aware of the issue, but it was really driven home by some of the discussion. I thought I’d share my musings on the subject in a post. 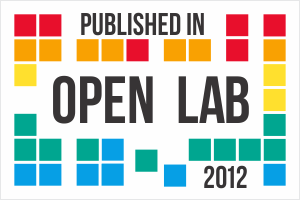 For “normal” transparent media (i.e. materials we encounter on a daily basis like glass and water), the refractive index may be essentially defined as the fraction by which the speed of light is reduced in the medium: that is, the speed of light in a medium of refrative index becomes . This idea of a negative refractive index was first proposed by Veselago in the 1960s1, though it gained little attention until Pendry suggested2 in 2000 that negative refraction could be used for lots of non-intuitive effects, such as “perfect imaging”. After Pendry’s paper came out, many experimental researchers rushed to be the “first” to demonstrate negative refraction. But is a negative refractive index necessary to have negative refraction? In fact, the answer is a resounding “no”, as apparently many researchers were aware even when Pendry’s first paper came out. As a simple thought experiment, consider light incident from medium 1, with an ordinary refractive index, into a medium 2 which can support surface plasmons. A surface plasmon is an electron density wave which propagates in the surface of certain metals with the right material properties. Because a plasmon consists of oscillating electric charges, they also have an electromagnetic field associated with them which also carries energy. The excitation of plasmons in a material is a somewhat complicated process (discussed a bit in this post) which we gloss over for simplicity. Let us assume (and this is not necessarily a justified assumption, but a convenient one) the transverse momentum of the incident wave is conserved as it enters the medium, i.e. 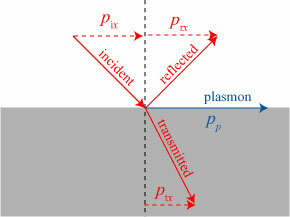 where represents the momentum of a photon which is converted into the ith mode, be it reflected, transmitted, or plasmonic, and represents the fraction of photons which enter this mode, such that . We have negative refraction, but without a negative refractive index! In fact, experiments have been done to demonstrate this sort of effect3. Negative refraction has also been demonstrated in photonic crystal materials, which also do not possess a negative refractive index4. Any experimenter wishing to demonstrate that they have a true negative index material must therefore do more than simply demonstrate negative refraction! Our discussion of negative refraction in the context of momentum raises another interesting question: how is momentum conserved in a true negative index material? 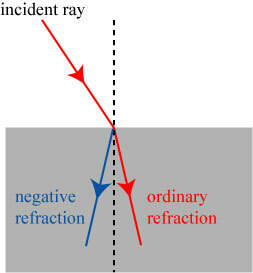 From the pictures above, the refracted ray takes a sharp turn upon entering the medium, without any obvious compensating wavefield to keep momentum conserved. Evidently the extra momentum goes into the medium itself; roughly speaking, because the light ray is bent to the left in our picture, the medium must get a ‘kick’ to the right. However, as we have noted previously, the concept of light momentum in a medium is full of pitfalls, and the best we can readily say is that the medium makes up for any momentum which is seemingly missing in negative refraction. 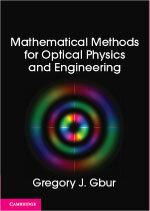 As one can hopefully see from this post, there are a lot of interesting questions which arise in the discussion of metamaterials above and beyond the neat optical effects which can be observed. 1 V.G. Veselago, “The electrodynamics of substances with simultaneously negative values of ε and μ,” Sov. Phys. Usp. 10 (4) (1968), 509–14. 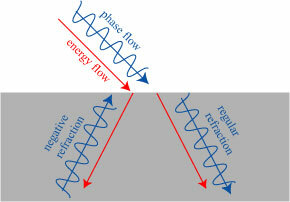 2 J.B. Pendry, “Negative refraction makes a perfect lens,” Phys. Rev. Lett. 85 (2000), 3966. 3 Z. Ruan and M. Qiu, “Negative refraction and sub-wavelength imaging through surface waves on structured perfect conductor surfaces,” Opt. Exp. 14 (2006), 6172. 4 C. Luo, S.G. Johnson, J.D. Joannopoulos and J.B. Pendry, “All-angle negative refraction without negative effective index,” Phys. Rev. B 65 (2002), 201104. Stating that “Any experimenter wishing to demonstrate that they have a true negative index material must therefore do more than simply demonstrate negative refraction” is a fact we often forget. Also, I do not know if anyone has ever demonstrated beyond doubt a true “negative index material”; it seems to me that so far only “negative refraction” has been shown in metamaterials / photonic crystals / metals. For the case of a hypothetical “negative index material” (NIM), not only does conservation of momentum seems to be problematic (as shown in this post), but the closely-related phenomenon of “time reversal” [J. Pendry, Science 322 (2008)] is no more intuitive. The demonstration using Snell’s law implies that transmitted waves in medium 2 are homogeneous (i.e. not evanescent like plasmons). Thus we can show that Snell’s formalism at the vaccum-NIM interface requires enforcing “negative time” in order to yield a transmitted plane wave with a proper wavefront. Furthermore, a recent theoretical investigation points that a NIM would violate the second law of thermodynamics if it existed [V. Markel Optics Express 16 (2008)]. Hence the existence of a “true” NIM still raises a number of fundamental questions IMHO; meanwhile research for negative refraction and related devices is still going strong. polarizable medium reveals that negative refraction is impossible” by Vadim Markel (from OPEX, I think) may interest you. A really stupid question, just touching the photons here. 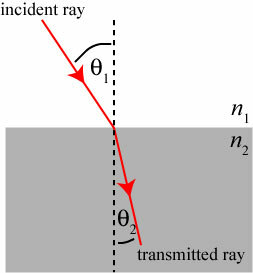 When they, your ‘ray of light’ hit your object and get projected into those ‘three components: a reflected ray, a transmitted ray, and a surface plasmon.’ How should I understand that? As if each photon ‘wavepacket’ interacting, in its ‘mediation’ get split up into three components, superimposed too? And if they do, is that the way I can expect all light to act when ‘interacting’? As I said, it’s a weird question. From a wave point of view, the wave amplitude gets split into three parts: let’s say, for argument, 1/3 into each component. If we imagine a single photon hitting the surface, the wave of the single photon is interpreted as a probability density: when we actually perform a measurement of the photon’s behavior, 1/3 of the time we’ll find it was reflected, 1/3 transmitted, 1/3 plasmon. I’m trying to integrate wavepackets in my conceptual thinking. From a particle view you will observe one chance in three for every measurement, using three ‘observers’? But for a wave all three happens when measured? First, the ‘1 in 3’ was just some numbers for argument’s sake: the actual probability of the outcomes depends on the behavior of the system. The way to think about the wave behavior is that a wave is a large collection of photons, each of which travels through an optical system as a wave but interacts with a detector as a particle. 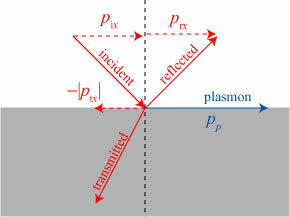 Let’s suppose you set up three detectors to measure whether a photon is transmitted, reflected, or turned into a plasmon. If you send photons through the system one at a time, you will only detect each photon at one place. When you combine the results from a large number of photons, however, the results build up a wave pattern. I probably explain this more clearly in my post on Young’s experiment. I’ll check that one up.